As an Ohio resident I am upset that my electrical rate has gone up at a 5.1% annual rate since 2011. It is not like we have a shortage of electrical power generation or any of its fuels. I did my fair share of improving my carbon footprint but rate increases overwhelmed all of my cost savings from improved insulation and LED light bulbs. The renewable lobby has over promised the cost savings and new jobs for years and the middle class has been stuck with the bill. Last year the Ohio legislature finally said we need to pause the renewable energy mandates and take a close look at why this program has consistently under-performed. Hurray! A group of legislators who actually did their job! For middle class people whose salaries have been stagnant, the “Green Energy” mandates reminds us of the Affordable Care Act since the only thing worse than my electrical rate increases has been the 11.7% annual increase in my health insurance premiums. For those middle class people who balance their budget on a regular basis we are getting slapped in the face by our “friends” in government trying to help us. If this is helping the middle class, I want less help. Both of these programs share the same management style that encourages government incompetence and cronyism at the expense of the middle class. My electric company replaced my electric meter last month with a smart meter and said I could view the meter data online. So when I was paying the bill last month I took a look to at the data. The hourly data looked interesting since at first glance it looked like it peaked during dinner time. 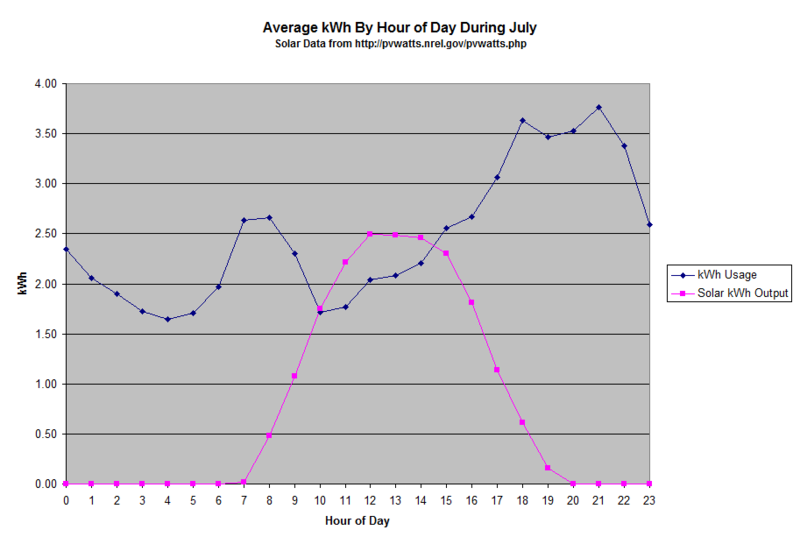 To get an idea of electrical usage on a typical day I download July’s data and averaged it per hour. Sure enough it peaks around dinner time. My first thought was how is solar power going to help me if it peaks around lunch and I need it at dinner time. The only remaining question was how much solar power was being generated around dinner time. So I went over to PVWatts® Calculator to estimate my solar power capability. As you can see below the solar power drop off is significant after 3 pm. By the time my air conditioner and stove are creating my peak electrical demand, solar power has become an insignificant contributor. 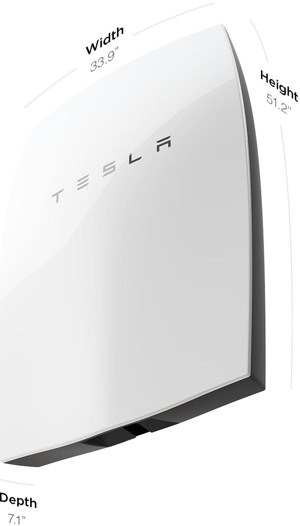 It looks like I need a significant investment in batteries for this project to provide most of my electrical power in July and an even larger investment in solar panels and batteries to provide the power in my peak electrical usage months of December, January, and February. Roughly half the aerosols that affect air quality and climate change in North America may be coming from other continents, including Asia, Africa and Europe, according to a new study. Although they did not discuss the ratio of dust to combustion aerosols from North America, I would not be surprised if the ratio was even larger for particulate pollution in North America. In a previous post, The Battle over Clean Air Standards, I found it easy to conclude from the EPA site on asthma that combustion aerosols have a weak link to asthma. If dust is the major contributor to our problem with particulates then the regulations on coal plants are a very small part of the solution. Every time I look at the science behind the increased coal plant regulations is I find the argument for stronger regulations is just not there.